The courage to get in there and express what is fully human. I believe that is the artist’s responsibility, but I struggle with this. Bunny Burson’s show Hidden in Plain Sight, opening March 7 at Zeitgeist gallery, resonates with this personal and collective experience. 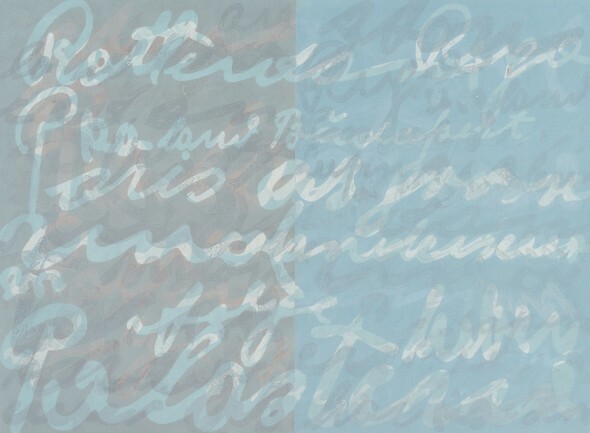 For the past five years Burson’s work has been defined by the emotional topography of hidden letters found in her mother’s attic, one hundred of them, written in German between 1939 and 1941. These letters, from her maternal grandparents to their son and daughter in Memphis, Tennessee, document the life and hopes of people desperate to escape the encroachment of the Nazis. Until Burson discovered them, in 2009, she didn’t know they existed, nor anything about the story they told. And that takes courage: “The courage to get in there and express what is fully human. I believe that is the artist’s responsibility, but I struggle with this. My mother said, when she attended a show of mine, ‘I wish this wasn’t my history.’ ” And yet, Burson has received letters and emails from people who’ve been to her shows—Native American Indians, immigrants, people whose family histories have nothing to do with this particular story—who feel a kinship. Don’t we all seek release from the power of untold stories? This ghosting on the page of images behind images, of letters dripping before being entirely washed away, of letters falling through space, of fragmented language and lost narratives, and maps like arteries with cities named like organs in an anatomy lesson of the planet—all these graphic signifiers, elegant and chilling, have a pulse that carries us back to the heart. Burson has understood the connection between art and healing for a very long time. While she was living in Memphis, her best friend was diagnosed with cancer. When Burson visited they drew and sang together, and she saw how much it helped them both. In the back of her mind she wanted to explore this relationship in her working life. “The best job I ever had was when I was hired at Vanderbilt back in the late 1980s to find artwork for new building renovation and the medical center. Something came across my desk about the Society for the Arts in Healthcare, and a whole new world of possibilities opened up to me. I discovered that all over the country, people were using the arts as part of the healing process. At the Vanderbilt Medical Center we brought in visual and performing artists to transform treating the ill into a less clinical experience. Hidden in Plain Sight is another manifestation of healing through art. Certainly Burson’s own healing, by reclaiming and integrating the legacy of her family into her work, but also for viewers, who are asked to face what is hidden, because what is hidden has always been there to see—if we don’t look away. See Bunny Burson’s art at her exhibit Hidden in Plain Sight at Zeitgeist. The exhibit opens with an artist’s reception on March 7, 6-9 p.m. and will be on view through April 25. For more information visit www.zeitgeist-art.com.